SOLAR BOAT TOURS AT UP TO 50% OFF AS WE PRELAUNCH WITH A KICKSTARTER CAMPAIGN! ​The provincial government of PEI is looking to the public to provide input to the Provincial Sustainable Transportation Strategy. ​Ride Solar is a private sector solution to an ongoing government commitment to help reduce provincial greenhouse gas emissions by 30 per cent below 2005 levels by 2020 as per PEI's Provincial Energy Strategy 1016/17. Canada's first SOLAR-electric public transit system employing both land and water vehicles in an integrated network for the purpose of commute, sight-seeing, and fun, Ride Solar provides a unique opportunity to see PEI from a different perspective in a way which has never been available to the public before. ​Ride Solar is clean, green, quiet, and fun - just like PEI! Cruise aboard the Isola Solaretto - North America's LARGEST solar boat & the world's FIRST solar-powered dinner cruise and tour boat. Originally a "vaporetto" during the 1967 Montreal Expo (World's Fair), this 52 year old Canadian Heritage vessel has been completely retrofitted & repowered for solar powered cruises. Operating out of the Charlottetown Marina from May - Oct every year..
Come aboard our comfortable "dining room on the water" for 90 min daytime eco-harbour tours, all-inclusive 5 course surf & turf evening dinner cruises, and 2 hr midnight champagne & oyster cruises with live entertainment! With free WiFi, full kitchen, licensed bar & bathroom, this Ride Solar dinner cruise & tour boat is perfect for a private getaway or to host your next work, family, or group function/party. "Expo Service No 5" as it was known at the Montreal Expo was decommissioned along with all the other Vaporettos and actually found its way to the Charlottetown Harbour in 1970 for 2 years doing harbour cruises. Kept in its original form, tours aboard the M/V Vaporetto Queen, as she was then known as, were just $2/adult and $1/child. 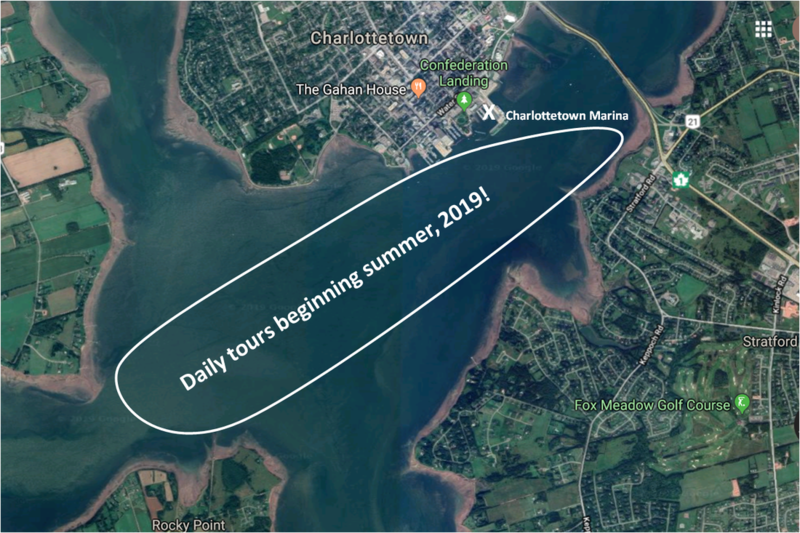 Nearly 50 years later, the same boat (completely refitted & repowered) is now back in the Charlottetown Harbour better than ever to give you a tour experience on the water that cannot be had anywhere else in the world! Prices start from $25/person. Click HERE for more information or to book your solar boat ride. 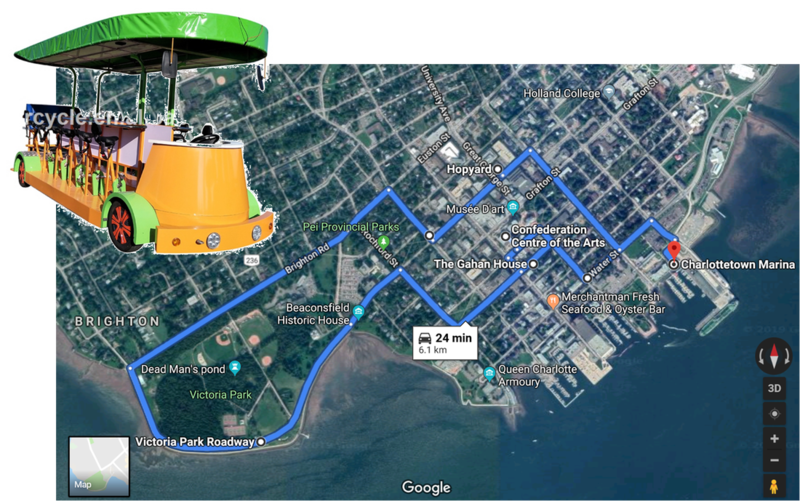 Take a ride on the Island Solar Pedal Bus throughout downtown Charlottetown to visit some of PEI's best pubs and most scenic/historic venues! The first pedal bus tour in Atlantic Canada, Ride Solar's unique tour offers up to 18 passengers an opportunity to pedal your way to pubs sight-seeing locations in beautiful downtown Charlottetown - the birthplace of Canada. ​Prices from $33/person. Click HERE for more information or to book your solar pedal bus ride. MORE SOLAR RIDES COMING SOON! Ride Solar is Canada's first solar-electric public transit system employing both land and water craft in an integrated network for the purpose of commute, sight-seeing, and fun. Providing a unique opportunity to see PEI from a different perspective in a way which has never been available to the public before, Ride Solar is clean, green, quiet, and fun - just like PEI! If you are interested in starting a solar ride in your area - we can help! Please contact us. ​If you already have a solar ride in your area - please contact us so we can list you on our web site!